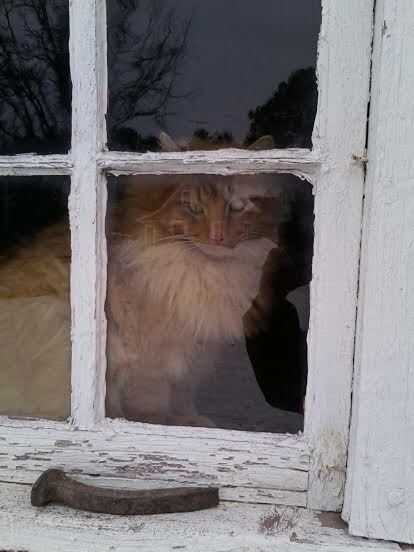 Stanley is our barn cat. He came to the farm the winter of 2012 – his name was “Kitty” but my friend’s daughter thought he should have a better name. When asked what a better name might be, she said, “I don’t know…like Stanley or something”. Good enough for me. Stanley isn’t considered an “exhibit animal” but he is a cat, and wanders wherever he pleases. He may or may not stroll through and say “hi” while you’re here. I was worried that he wouldn’t want to stay here, but said I would give it a try. JaiJai had been an absolute brat to our other cats. Cats are NOT squeaky toys!! 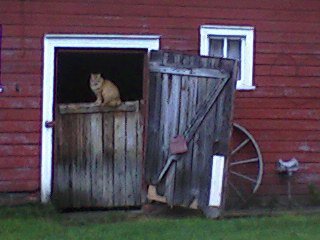 As it turns out, Stanley is the perfect barn cat for the farm. 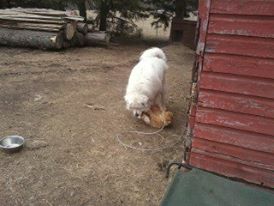 He doesn’t run from the Ginormous White Slobbering Dog…or any of the other dogs for that matter. A cat that doesn’t run – doesn’t get chased. I love cats with attitude! He is so perfect for the farm. Nice posts. Good to see you are both busy and as kooky as always! Thanks! I think… Stanley stowed away Friday night in our friend Carrie’s car. She couldn’t figure out why she heard meowing–thought it was a toy of her son’s. He’s back home now. Bahahahaha! Maybe he’ll learn not to jump in strange cars!